Taking as its starting point the controversies and protests surrounding the mass installation of prepaid water meters in Soweto, this talk tracks the centrality of infrastructure as a medium and terrain for politics from the apartheid period to the present. The paper shows how apartheid was defined by a specific infrastructural techno-politics whose material remainders retain their political charge in the post-apartheid present. Exploring democracy from the perspective of its infrastructures reframes the conventional story of South Africa’s “transition,” foregrounding the more oblique continuities and more durable legacies of the apartheid era. In looking beyond liberal imaginaries of rights, deliberation and free circulation, the paper also proposes to think in more material terms about citizenship and the political in the postcolonial world. Antina von Schnitzler is an Associate Professor in the Graduate Program in International Affairs and an affiliate faculty member in the Department of Anthropology at The New School in New York. Her research and teaching has focused on citizenship and political subjectivities, the anthropology of infrastructure and technology, liberalism and neoliberalism, colonialism and postcoloniality, energy politics, and South Africa. 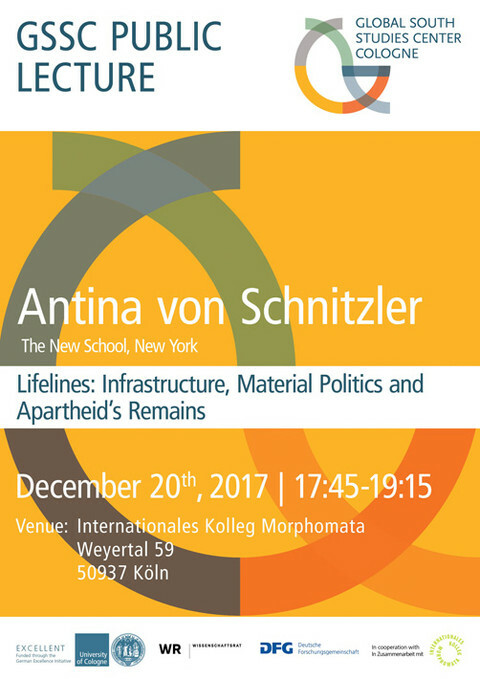 She is the author of Democracy’s Infrastructure: Techno-Politics and Protest after Apartheid (Princeton University Press, 2016). She is currently working on a new research project on the techno-politics of coal and energy transition in South Africa. She holds a BA in Social Anthropology from the University of Sussex and a PhD in Anthropology from Columbia University. She has held visiting appointments at Reed College and the University of Notre Dame, and is a Research Associate at the Wits Institute for Social and Economic Research (WiSER), University of the Witwatersrand, Johannesburg.